A couple of weeks after Tripura Chief Minister Biplab Deb's remark over Internet and Satellite communication existed during Mahabharata, his counterpart Gujarat CM Vijay Rupani on Sunday stated that mythological character Narad Muni was like Google as he knew everything that was happening in the world. Speaking at an event to felicitate journalists, Gujarat CM Rupani said Narada was a ‘true journalist’ who had every information what happening in the world but shared only what was good for the mankind. “Narada had information of the whole world and can be compared with Google in today's time. However, he only shared the information which was beneficial, and not harmful, to mankind," Rupani said. “That is why he is accepted as Rushi — a person who works for benefit of people. He is often portrayed as snitching on people, but in reality, he only shared information for the welfare of people," the Chief Minister said. The event to felicitate journalists was organised by Vishwa Samvad Kendra-- the media wing of Rashtriya Swayamsevak Sangh (RSS). 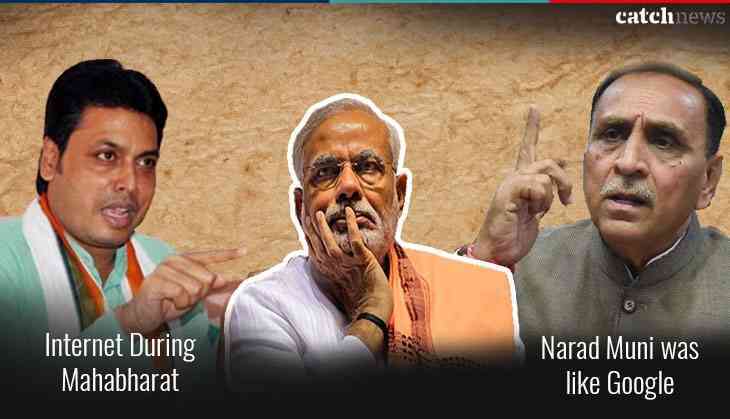 BJP leaders are recently making rows due to their controversial statements. Earlier after his remark on the Internet during Mahabharat, Mr Deb on Sunday advised youth to not run behind politicians instead set up Paan shop or milk cows for livelihood. According to reports, Prime Minister Narendra Modi and BJP chief Amit Shah have summoned Deb over his controversial statements. The Chief Minister has been summoned to meet Modi and Shah on May 2 in the national capital.